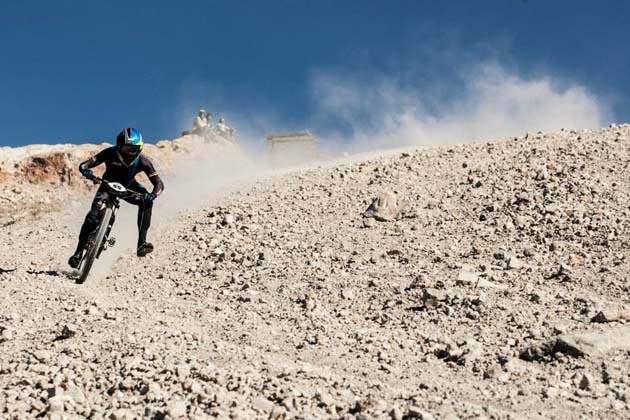 The famous Kamikaze course starting at the 11,053-foot summit of Mammoth Mountain was in the spotlight once again during the recent Kamikaze Bike Games. To most mountain bikers, Mammoth Mountain needs no introduction. This is, afterall, the ski resort that pioneered lift-accessed riding and, in turn, transformed a non-descript, dusty access road into one of the most famous race courses in the world. 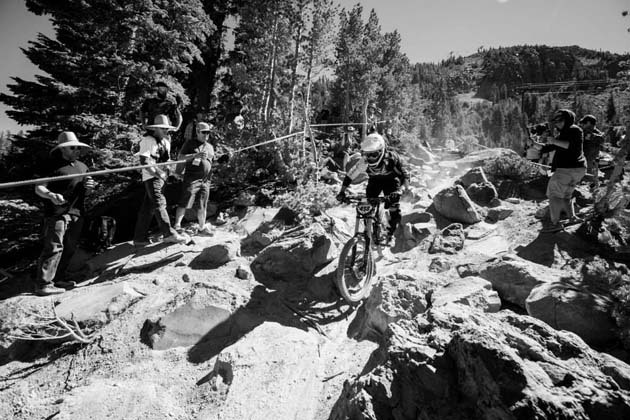 Three decades after the Kamikaze Downhill race debuted, riders from around the globe still travel to the Eastern Sierra Mountains to channel their inner John Tomac or Greg Herbold on Mammoth's hallowed volcanic pumice. But, despite its rich cycling history in the 80s and 90s, mountain biking barely registered on the radar of resort executives in the 2000s, an era of new construction as Mammoth rode high on investments from then-majority owner Intrawest Corporation. The famous Kamikaze race ended in 2001. "We'd been doing it for 16 years," said Bill Cockroft, a 45-year Mammoth Mountain employee who came up with idea for the Kamikaze race back in 1984. "I didn't have anybody behind me. There wasn't a real instigator to push or pull, and I was happy to not do it." Other big races trailed off too. The final NORBA race was in 2005, and the Whiskey Creek Stage Race, once a major stop on the North American road racing circuit, had been gone since 1993. The Speed and Style Competition at the Kamikaze Bike Games. 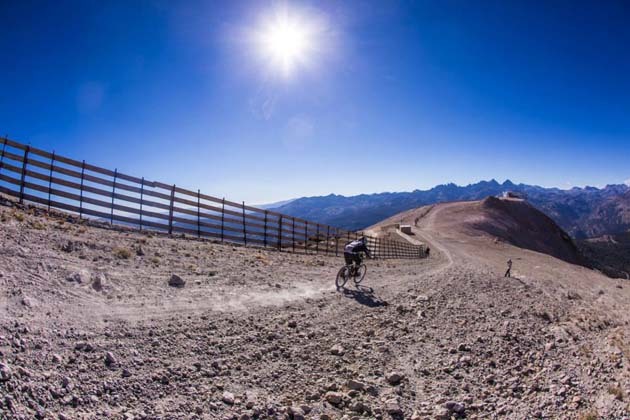 Now, as Mammoth Mountain emerges from a difficult past few years, it wants to revive its reputation as a world-class cycling destination in order to attract more visitors and drum up business in the financially-strapped mountain community. A federal judge recently dismissed the town of Mammoth Lake's bankruptcy case after the town settled a $43 million breach of development lawsuit filed in 2006 by its largest creditor. The town filed bankruptcy last July stating it couldn't afford to pay the developer, and the two parties settled the following month. On the heels of that financial fiasco, the mountain's CEO and the town's mayor were discussing how the region could aggressively attract more visitors. The idea of bringing back a bike race came up. Cockroft, who started working at Mammoth as a 21-year-old ski patroller and is now a senior VP at the resort, was ready to revisit the Kamikaze. 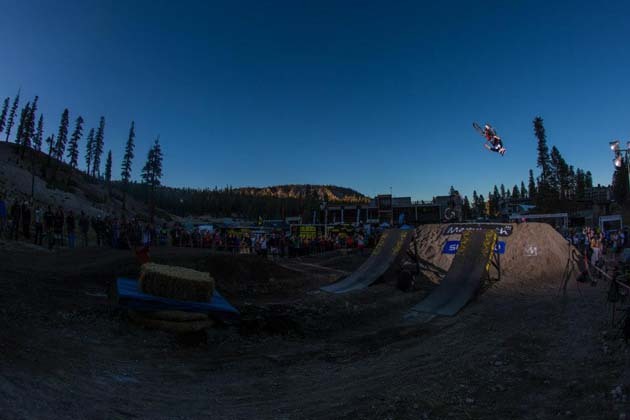 He and the mountain operations team jammed for six months to prepare for the new Mammoth Kamikaze Games, which ran from Sept. 4-8. The weekend included a downhill race, an enduro, cross-country, dual slalom and speed and style and, perhaps the most anticipated, legends of the Kamikaze. Just like it sounds, that race brought back original racers like Brian Lopes (who won, on a 29er, on his birthday), Herbold, Joe Lawwill and Leigh Donovan to once again tear down the course at mach speeds. This time around with more suspension and fewer brightly colored skinsuits. Brian Lopes tears down the Kamikaze in the Legends race, which he ultimately won on his 29er Ibis Ripley. More than 1,700 people registered for the races and rides, which also included a road century and gran fondo, about 740 of those participated in mountain-bike events. The enduro tested riders on the loose pumice, rock gardens and wooden bridges littered throughout the double black diamond Bullet DH and black diamond Follow Me trails. The race finished with a gondola transfer that shot riders up to the 11,053-foot summit of Mammoth Mountain to the start of a 5.3-mile timed downhill run skirting the edge of the famous Dave's Run bowl, then dropping 2,700 feet to Canyon Lodge. If they were brave enough to unpeel their eyes from the rocky, technical trail, riders were rewarded with a panoramic view of the jagged peaks of the Sierras dotted with high-alpine lakes, before dipping into the trees at mid-mountain. Even though only 60 percent of the 300 race slots filled in its first year, it's that enduro race that Cockroft sees the most potential in as Mammoth reinvents its mountain biking identity. "It was pretty fun to see there was an appetite for the race in Mammoth," he said. "I was talking to the guys here like Brian Lopes, Greg Herbold, Joe Lawwill, those guys were very complimentary that we pulled off the enduro. I think there's a big avenue for enduro and I think we could make a big mark." Cockroft, who was previously the president of NORBA for a decade and helped the USA Cycling push to get mountain biking in the Olympics, has also considered lobbying for a stop on the Freeride Mountain Bike tour to bring more attention to the trails. In the mean time, Mammoth continues to invest in its mountain-bike park, the main attraction for summertime visitors. Right now, Mammoth gets about 40,000 paid visits during the summer compared with 1.3 million during the winter. The double black diamond Bullet DH trail in the Mammoth Mountain Bike Park has been upgraded to make it more sustainable. Dave Geirman is the man tasked with keeping the mountain's 80 miles of trails updated, ridable and fun, no easy task given its almost moonlike characteristics with exposure, loose rock and a lack of dirt. If you've ever grinned while flying down the pavers in Twilight Zone or arcing on the signature wooden bridge on Follow Me, direct your high-fives to Geirman, the mountain's bike park director and another one of Mammoth's earliest employees. After building the beginner-friendly Discovery Zone last year, Geirman plans to spend the next couple of summers making sure the existing trails remain ridable and sustainable before embarking on building new XC and DH trails. He would like to see the Kamikaze Bike Games grow into an entire bike week with a festival atmosphere that showcases the park's variety of trails and unique building techniques, and elevates Mammoth back to a household name. "We consider ourselves one of the top three parks behind Whistler, and it's debatable whether we've surpassed Northstar or not, but we think we're back in the mix as one of the better competitors out there," Geirman said. The dual slalom competition during the Kamikaze Bike Games brought out a decent sized crowd. 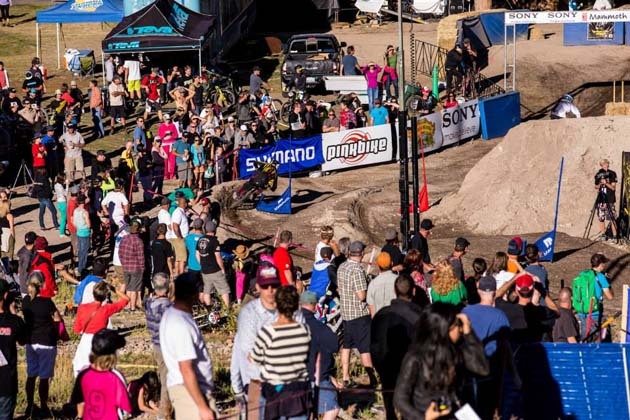 Execs at Mammoth hope more mountain bike races and competitions will help Mammoth once again become a household name.